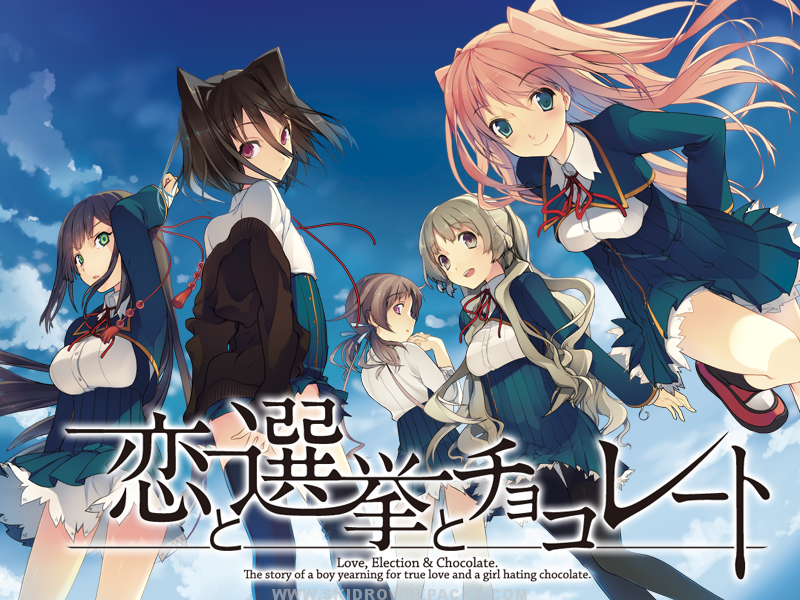 SKIDROW Repacks – English visual novel Koi to Senkyo to Chocolate Free Download for PC windows released on 17 Mar 2018. Two childhood friends attend Takafuji Gakuen: Yuuki, who wants to fall in love, and Chisato, who hates chocolates. They are part of the food research club along with their friend and classmate Mifuyu. Even though it’s a food research club, they don’t actually do anything except for buying candy with the club budget and enjoying their time together. It is an irreplaceable place to them. However, the club’s existence is in danger with one of the student council president candidates, Satsuki, vowing to close all clubs that don’t do anything. Since their club is in this list, they do their best to save it but there’s no other way but to participate in the student council president elections and defeat her. Yuuki is persuaded by Chisato to run in the election. At first he isn’t interested at all, but since the club members are trying their hardest, he too wants to win to save the club. You have to change system locale to Japanese (AppLocale is reported to not working with the game). For Windows 10 – You have to change system locale to Japanese then add an optional feature of the Japanese font(Settings > System > Apps & features > Manage optional features > Add a feature > then download and install Japanese Supplemental Fonts). Run KoichocoHook.exe, copy the serial in the text file and paste it in the empty space, then click on the first button under the empty space to play. If you can’t start the game, try moving the game folder to another local disc(like the root directory or Program Files), turning off your Antivirus program(especially if you’re using McAfee or Symantec) as some anti-vurus programs don’t like the crack(hook.dll, KoichokoHook.exe and start.exe – false positive), start as admin or restart your PC. Fixed Mifuyu route, the 1.0 patch had a slightly older version of the route included. Fixed a censored CG that was accidently included from the all-ages edition. Fixed several translation issues in all routes. Other typo and QC corrections in all routes. This is a Trojan isn’t it?